Since the serpent, Satan, lied to Eve about the forbidden fruit (Gen. 3:4-5), mankind has played fast and loose with the truth. But as Sir Walter Scott once so eloquently stated, "Oh what a tangled web we weave, when first we practice to deceive." There was a time, however, in American history when a "man's word was considered his bond." But as Dr. Laura Schlessinger wrote a few years ago in her book about the Ten Commandments, we've moved far from that philosophy of life today "to a society in which 'people are more accepting than ever before of exaggerations, falsifications, fabrications, misstatements, misrepresentations, gloss-overs, quibbles, concoctions, equivocations, shuffles, prevarications, trims and truth colored and varnished.' That acceptance has surely changed the moral landscape of this nation in everything from the disappearance of common social courtesies to the prevalence of vulgar and vicious radio and television programming, from disrespect for traditional sexual and marital mores to the ever-growing cynicism about the potential of goodness to survive anywhere." The Bible says that the devil is the "father of lies" (John 8:44). Jesus is the personification of truth (John 14:6). Although we are made in the image of God, perhaps we are never more like the devil and unlike God than when we tell lies. 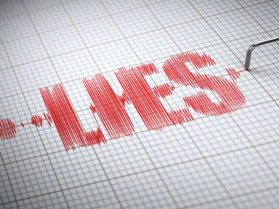 Lying is, unquestionably, the modus operandi of our time. We've come to expect it so much that it really doesn't seem to bother us. The Press and media lie. Advertisers lie. Activists lie. Businesses lie. Lobbyists lie. Lawyers, lawmakers, and judges lie. Public officials lie. Preachers and Priests lie. Politicians lie. Unless the lie is deemed to directly hurt us in some fashion, we simply pass it off as the way society functions. Moreover, at times we believe a little white lie or stretching the truth is necessary. As the Psalmist wrote, "Help, O Lord! For the faithful are no more; the loyal have vanished from among men. Men speak lies to one another; their speech is smooth; they talk with duplicity" (Psalm 12:1-2). This culture of lying is never seen more clearly than in the two front runners for the Presidency of the United States. Democratic candidate Hillary Clinton, recently told CBS news anchor, Scott Pelley, "You're asking me to say, 'Have I ever [lied]?' I don't believe I ever have. I don't believe I ever have. I don't believe I ever will. I am going to do the best I can to level with the American people." But polls show Clinton struggles with serious dishonesty perceptions. Western Journalism lays out certain lies by the former Secretary of State: (1) Chelsea, her daughter, was jogging around the World Trade Center on 911, (2) she landed under sniper fire in Bosnia, (3) she was named after Sir Edmund Hillary, (4) her family was dead broke when they left the White House, (5) she was instrumental in the Northern Ireland peace process, and, of course, (6) Benghazi. Did you ever think it would be possible for a Presidential candidate to be winning the nomination of its Party in state after state, while a suspect in an FBI investigation – one that involves national security? Granted, Clinton is presumed innocent in our system of justice until proven guilty, but has the question of honesty in politics become so unimportant the public ignores the risk to the country. The National Review notes that Donald Trump, the Republican front runner for the Presidency, has a reputation for telling "yuuge" lies. He's lied about his actual wealth. He's lied about his bankruptcies. His actual position on matters like the war in Afghanistan, government healthcare, abortion, Planned Parenthood funding, Syrian refugees, the flat tax, and a hosts of other issues are so contradictory it's impossible to know what he really believes. National Review also notes the affair he had on his first wife and the multiple affairs he says he's had with married women. That, undoubtedly, is some major deception. The magazine got it right when they concluded, "Trump's entire personal and professional history is Obama-esque: When it serves his interests, Trump lies." Sadly, profound support by evangelicals for Trump makes liars out of us too. When Bill Clinton was caught in the Monica Lewinsky affair, having lied about it to the public and given false testimony before the grand jury, evangelical leaders rightly criticized the President for his lack of character. They called for his impeachment. The message was that character was essential to the Presidency. Strangely, the same arguments used to defend President Clinton that were strongly condemned by evangelicals at the time – "I don't want a Sunday School teacher for President" and "I don't want a Pastor-in-Chief" – are the same erroneous contentions by certain evangelical leaders today in defense of supporting Trump. Jerry Falwell led the charge back then. The irony! What liars we've become! How duplicitous! Russell Moore, president of the Ethics and Religious Liberty Commission recently said if evangelicals suspend moral judgment now in the pursuit of "winning," a tendency that they have always seen as decadent and deviant, then they are subject to lose who they are – who they are supposed to be in the world. There is a story about a grocery store in the country many decades ago. A woman came in to buy a chicken for supper. The butcher reached his hand into the vat where he kept the chickens and pulled one out. When he told her how much it weighed, she said she wanted one a little bigger. Since this was the last chicken the butcher had and the woman didn't know it, he reached down into the vat like he was fishing for another one, pulled out the same chicken, and claimed it was six ounces more. The woman paused for a moment and then said, "Okay, I'll take both of them." There are inevitable negative consequences to our lack of love for the truth in America – serious consequences – losses none of us can afford. Honesty is not simply the best policy, it's the only policy if our country is to really be, "whole again" as Clinton says, or "great again" as Trump says. "Oh what a tangled web we weave, when first we practice to deceive."